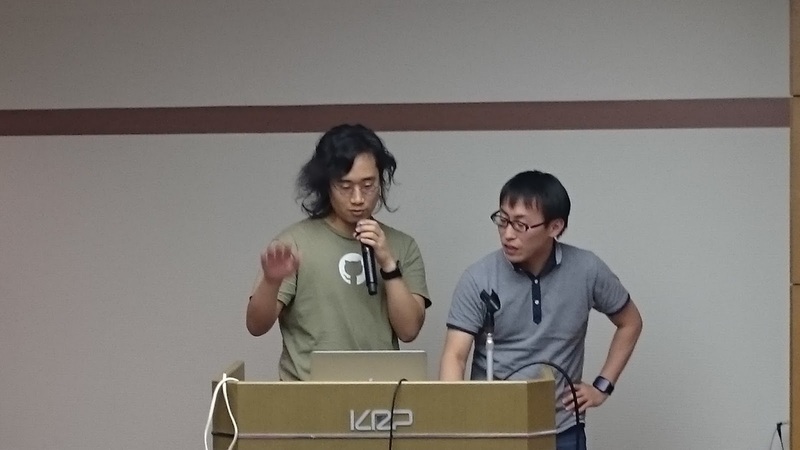 On July 25th 2015, Web Music Hackathon #4 was ran with GDG(Google Developer Groups) Kyoto at Kyoto. 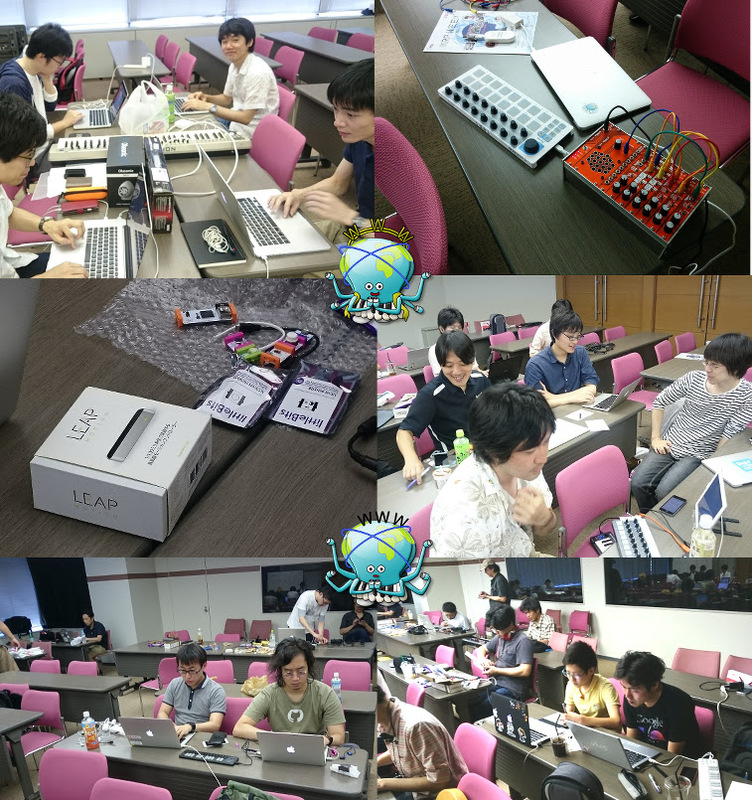 AMEI(Association of Musical Electronics Industry) provided digital musical instruments as usual for this hackathon. We thank AMEI for supporting this hackathon all the time. This time KRP(Kyoto Research Park) provided us a great room at great location at Kyoto! We also deeply thank for this help. Ok, let me introduce what happend at the hackathon along the schedule of that day. At first, I introduced our three of great tutors, who are @g200kg, @aike1000 and @sascacci, and they gave us presentation with several great demos. After tutors’ presentation is team building. 7 themes were picked up by the summary of questionnaire of “What would you like to hack at this hackathon?”, and that answer is required when attendees RSVP. At first, attendees divide into these themes of groups, and them they have discussion what to hack today before they start hacking in the group. During the discussion, changing theme is one of the choices. Result of the discussion, 2 themes were reduced. Following list is the final themes. At 4:30 pm, hacking time is over, and presentation time came. At this moment, most of groups said “we would like to more time…” actually. Now I explain the applications created at hackathon one by one. Emulates Reaktor on Web. This application gives us an ability to synthesize voices and to add sound effect with connecting boxes in the GUI. This application also had share feature by URL. 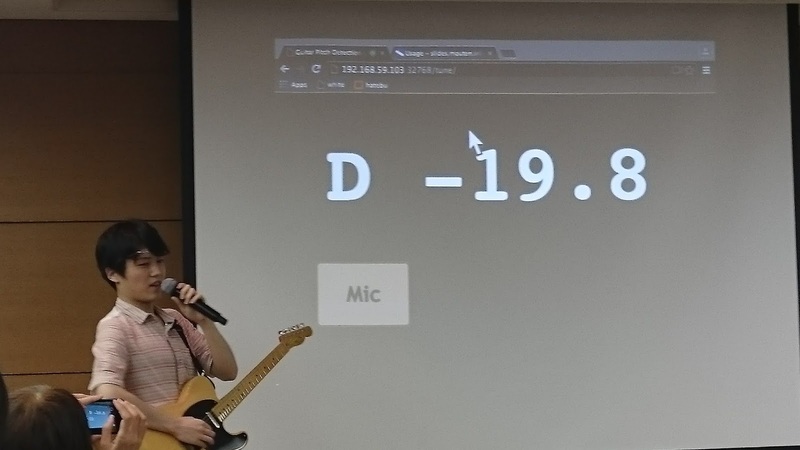 Guitar tuner on Web. 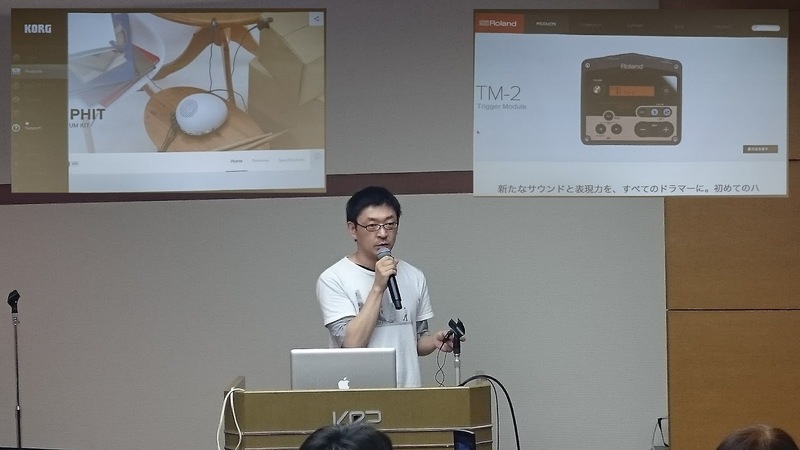 @moutend says that “Hardware tuner sometimes not easy to adjust tune by look.”, he solved these weakness of hardware tuner by this application: Uses big letter, Play sound to tune by sound without looking. The number located next to letter (“D” in the picture above) is representing how much cents are different from the right frequency. 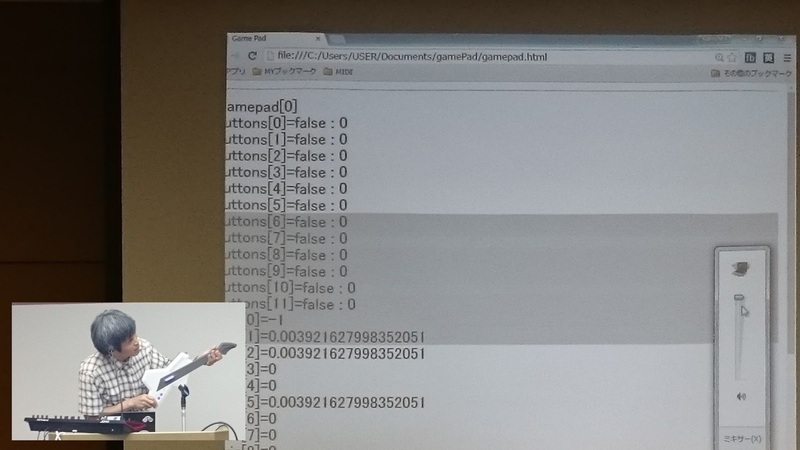 But he says that it still have bugs in detecting pitch sometime…..
Getting input message from gamepad with gamepad API. Gamepad input is converted to MIDI message, then sending MIDI message to MIDI tone generator(Roland JD-Xi) to play voice. But only “pitch bend down” is activated somehow. 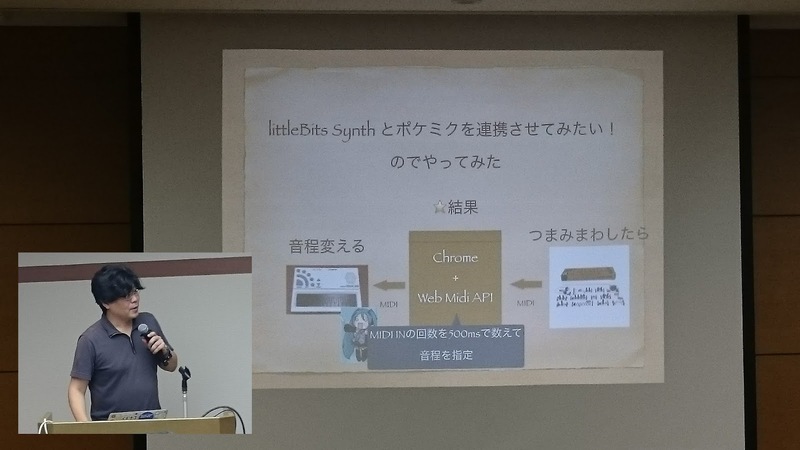 The output from littleBit send to Pocket-Miku through Web browser. 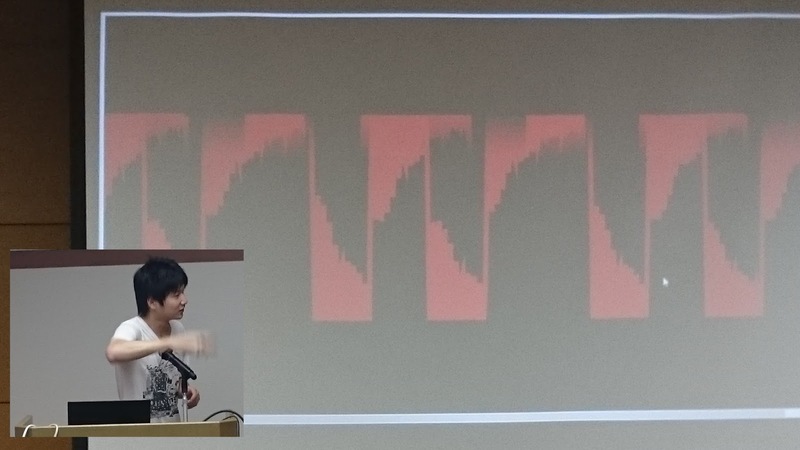 The way of defining pitch is counting input signal in each 500ms. All features, which are tone generator and parser of Leapmotion, is built on top of Electron(Cross-Platform Application build Engine for Desktop Application). No UI, but play tone generator by input of Leapmotion. And the interesting feature of changing filter by gesture is also implemented. A game of beating zombies. 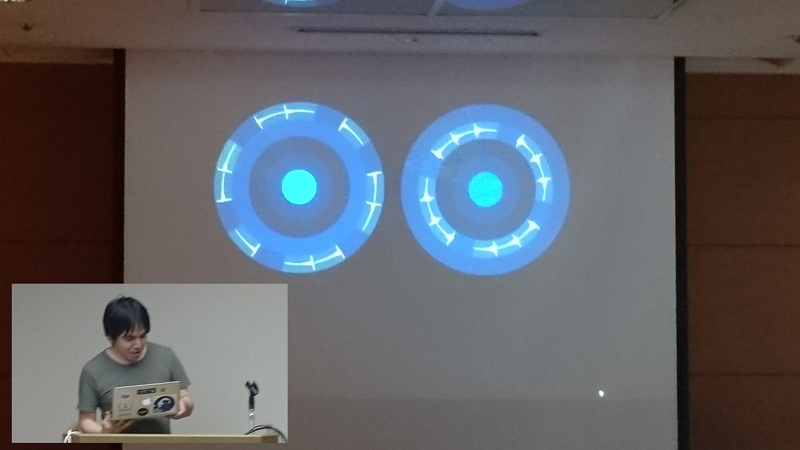 Game engine is build on top of Scratch, and MIDI inputs from Web MIDI API is used to change zombies moving pattern and controlling the number of zombies. Hacking by parent and child is the first time since Web Music Hackaton is started. This application has playing mode to change scale(minor, major, blues, etc.) automatically. Web MIDI API, Angular JS, Firebase, SVG, WebGL are used in this application. 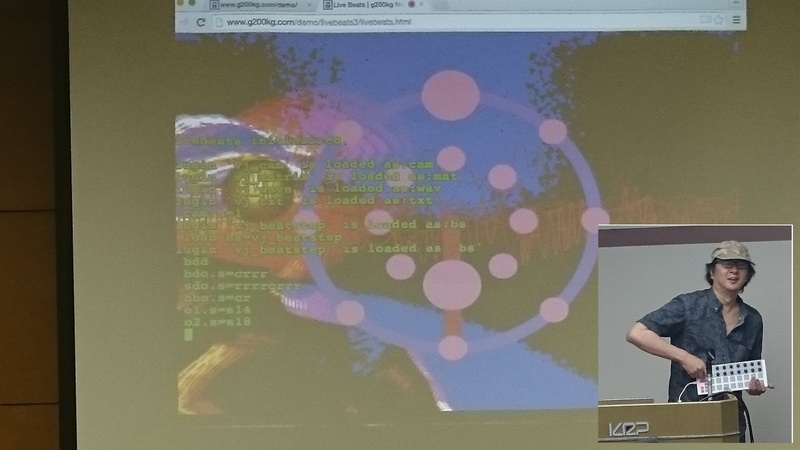 Several clients which has tone generator of Web Audio are connected to servers over WebSocket, and those clients plays with recieving message from server. So it enables to orchestrate with clients which are connected to server. 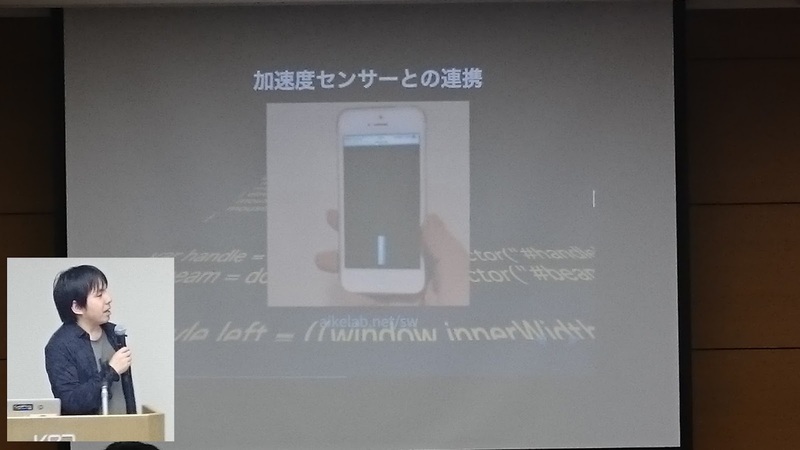 At their presentation, there were a network problem. The problem might be this, access point was used for video streaming and the access point used for this demo was same. 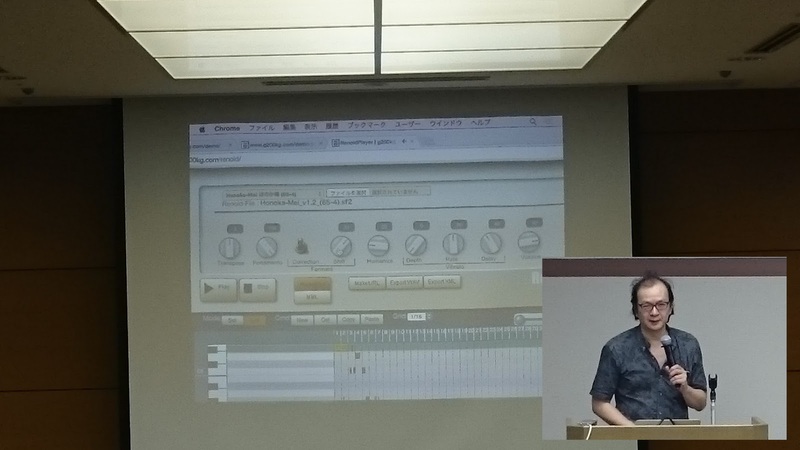 He explained easiness of implementing of Web MIDI API. 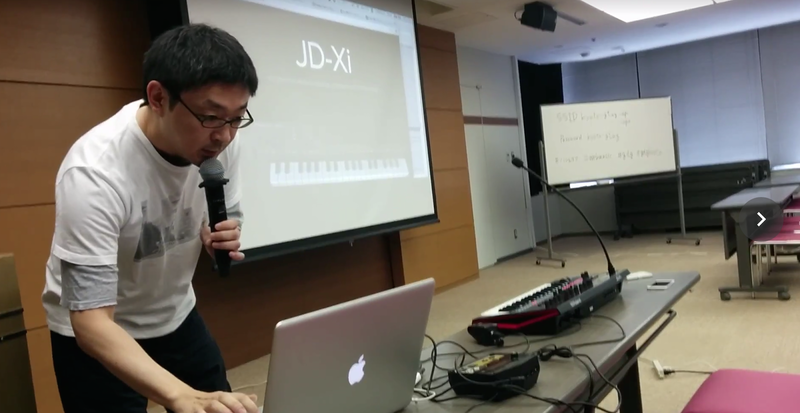 Actually, it was the first time to use Web MIDI API. Developed application is using KORG CLIPHIT (Make any surface electric drum only with clipping trigger) and Roland TM-2(tone generator especially for Hybrid Drum with trigger) . Connect 2 of CLIPHIT trigger to TM-2, and attach the each clip to your each foot, and TM-2 is also connect to browser by MIDI. 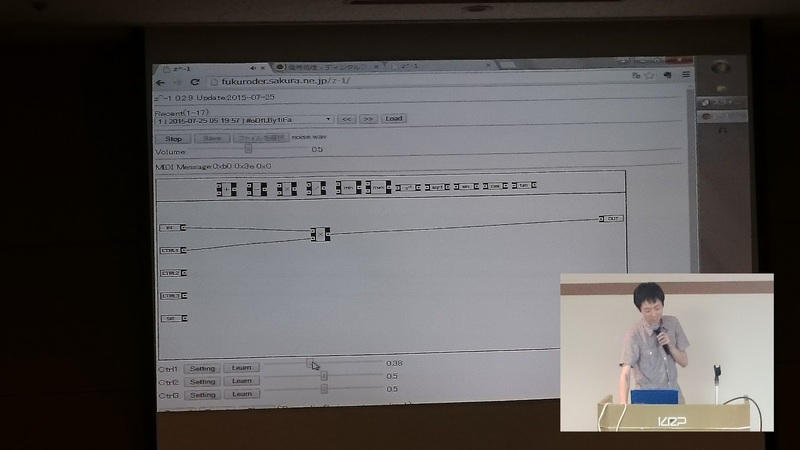 So with tapping feet, making drum sound by sending message to TM-2, and that signal is also send to browser by MIDI, eventually browser is able to update graphics in browser window by recieved the MIDI messages. From his work(he works for Roland), he said “Please use the clip of KORG’s CLIPHIT with Roland’s TM-2 at your own risk.” This notice made attendees’ laugh. Sometimes, sequence time line of rhythm machines is linear even if the sequence is set to play as loop. Since it is not so intuitive, so what he developed is rhythm machine which time line is shaped to round. Waveform is able to locate on the circumference. LiveBeats is the web application that create music by inputting music recipe(rhythm patterns, melodies and so on) from application’s command line. This application is also developed by him. This time he added MIDI input feature, and that feature allow users to play a music by MIDI devices along with the music created by command line. In the picture, he is playing a like playing the guitar. After these presentation, we(staff) selected 3 excelent applications by these three criteria of “Idea”, “Technical” and “perfection”. Actually, the selection process was difficult, because every application has great idea, and high perfection. 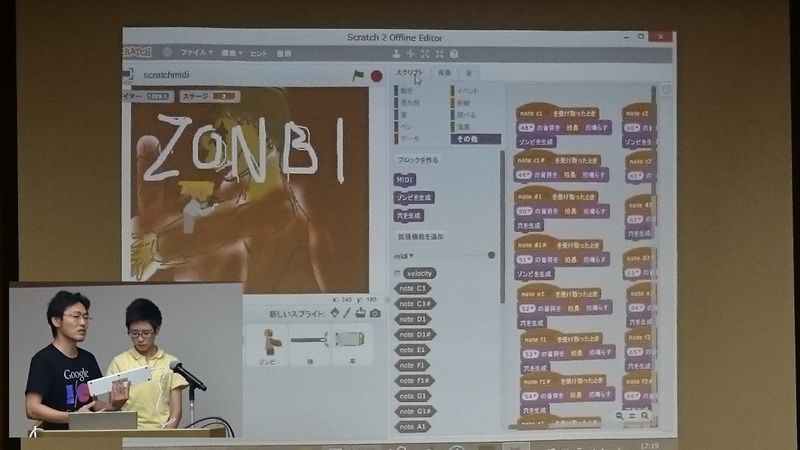 Scratch by kaisei, yokmama：The idea of the game is great, and we liked the challenge of collaborating child with parent to build one application. 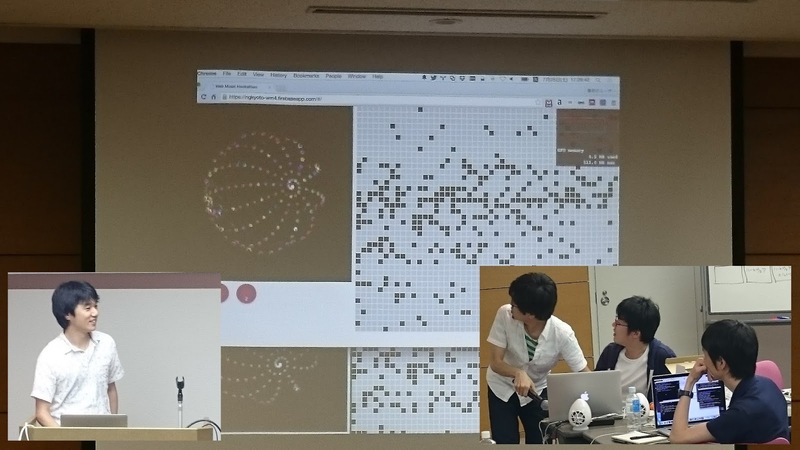 Sequencer by grid system by @ussy9、@_likr、pastelInc、@armorik83：With using several technologies, realtime and collaboration sequencer was high perfection. And the feature of automatic scale changer was great, too. The application highly satisfies all of the criteria. Distributed Sequencer by @mohayonao, @esperia09, @isocoda, @yasuraok：Fantastic Idea, and technically high level, and also perfection is high. The application also highly satisfies all of the criteria. 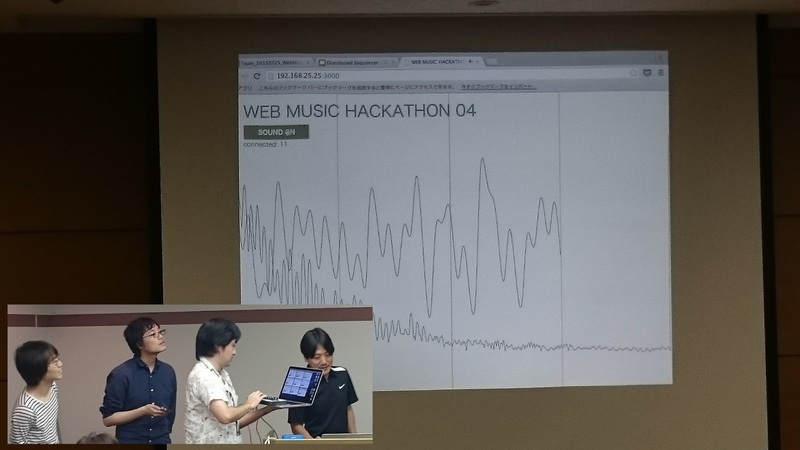 It was 4th time of Web Music Hackathon. Idea, technically, and perfection is getting higher and higher in each time. I hope I would like to run another one. I am looking forward to see you at next time!! 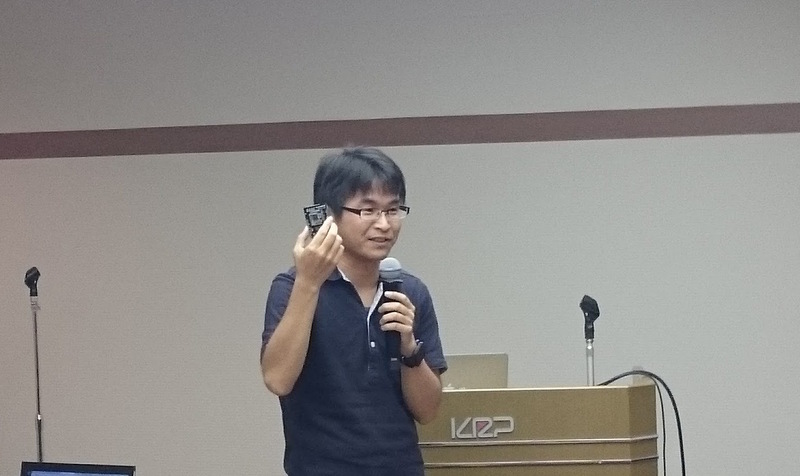 This was first time to run an event out side of Kanto area for me. So there are some worries, adding to that a typhoon might direct hit to Kyoto at the day of hackathon. (Eventually, it was not, but it was so close.) But almost all attendees who registered had joined the event and hacking all together. It was awesome things, and I am deeply appreciate that. 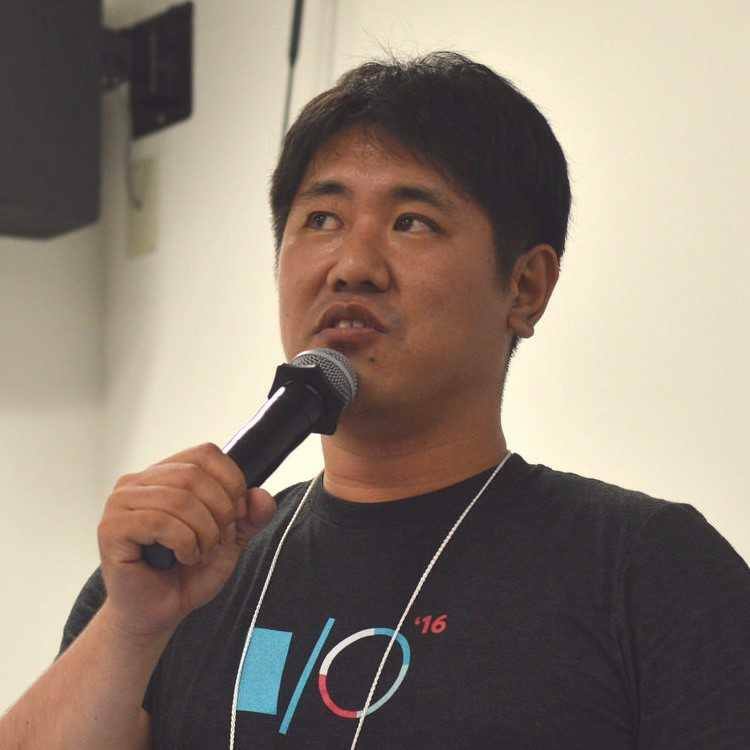 And to run hackathon in Kansai area, I want to say thank you for Ms. Kurano of GDG Kyoto, Mr.Tada and Mr. Noda of GDG Kyoto, and all of the staff from GDG. And also really appreciate to Mr. Terado of KRP for providing us a big and great room. Thank you very much!! Finally, I want to say thank you for @aike1000 to join the hackathon from Sapporo(Hokkaido), and @g200kg from Yokohama as tutor. I think this hackathon is run by attendees’ passion to build web music applications. So, please keep building your web music applications! !